Alex Krieger, FAIA has combined a career of teaching and practice, dedicating himself in both to understanding how to improve the quality of place and life in our major urban areas. 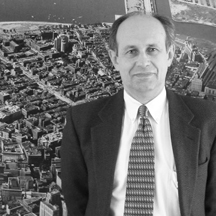 He has also served in several university-wide roles including as senior planning advisor for Harvard’s campus expansion into Allston, and on the recently established design review committees for both the Allston and Cambridge campuses. Mr. Krieger is a principal at NBBJ, a global architecture and planning firm. Offering services in architecture, urban design and planning since 1984, the studio, formerly Chan Krieger Sieniewicz, has served a broad array of clients in numerous cities worldwide, focusing primarily on educational, institutional, healthcare and public projects in complex urban settings. Mr. Krieger’s major publications include: Co-editing Urban Design (University of Minnesota Press, 2008) two volumes of Harvard Design Magazine, (focusing on the evolution of urban design as a discipline), 2005-06; Remaking the Urban Waterfront, 2004; Mapping Boston, 1999; Towns and Town Planning Principles, 1994; A Design Primer for Towns and Cities, 1990; and Past Futures: Two Centuries of Imagining Boston, 1988. He has also authored more than two-dozen essays on American urbanization for various publications. He lectures frequently at national conferences and universities. Mr. Krieger is a frequent advisor to mayors and their planning staffs, and serves on a number of boards and commissions. Among these: The U.S. Commission of Fine Arts, 2012-pr. ; Director of the NEA's Mayor's Institute in City Design, 1994-1999; Founder and co-director of the Large City Planners Institute, 1999-pr. ; Boston Civic Design Commission, 1989-1987; Providence Capital Center Commission, 1990-1998; Vice President of the New England Holocaust Memorial 1989-2000; Historic Boston Incorporated, 2004-pr. ; The Norman B. Leventhal Map Center Board of Directors and Chair, Board of Review at the Boston Public Library; Joseph Riley Institute, Charleston, 2000-pr. ; and as a Design Excellence Peer for the U.S. General Services Administration. Mr. Krieger received a Bachelor of Architecture degree from Cornell University and a Master of City Planning in Urban Design degree from Harvard. He is a Fellow of the American Institute of Architects.